Perfektes Hostel für Backpacker und entspannte Leute! Really enjoyed the stay in the hostel. It had everything a hostel needed. Stayed in a private double room, which was clean and nice. 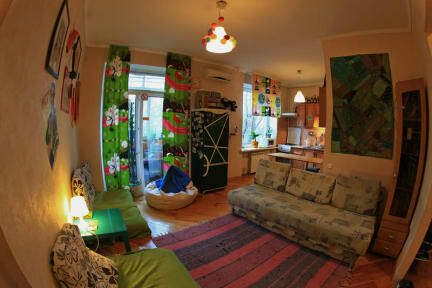 Hostel is in normal appartment building providing some feeling of the life of normal people in kiev. Staff was extremely helpful and friendly. We also highly appreciated that prices have been kept fair, despite the Champions League Final and many football tourists that would have paid 10x for the same room. Thanks a lot. Lovely staff, very clean, good atmosphere! Really good! but could be a little closer to the next metro station (15min walk). Everytime coming back to central station hostel feels like coming home. Always great people from all over the world, allways friendly and kind staff. 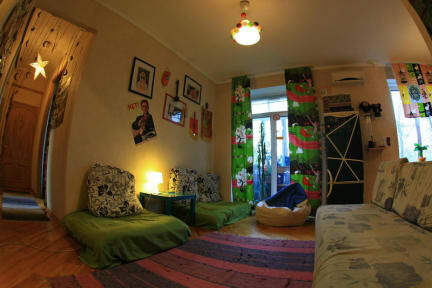 Really one of my favourite hostels worldwide. Everything was superb, except the location. It is a little bit far away from the central station (25min), a metro station (20min) or the city center (30min) by walking. Almost everything was fine! nice furniture, great showers, really cosy....!! Some of the staff were just a bit cold. I guess thats the ukrainian attitude but that doesn‘t make it OK in my eyes^^. In general: definitely recommendable. Lovely place with lovely staff! I would definitely go there again!